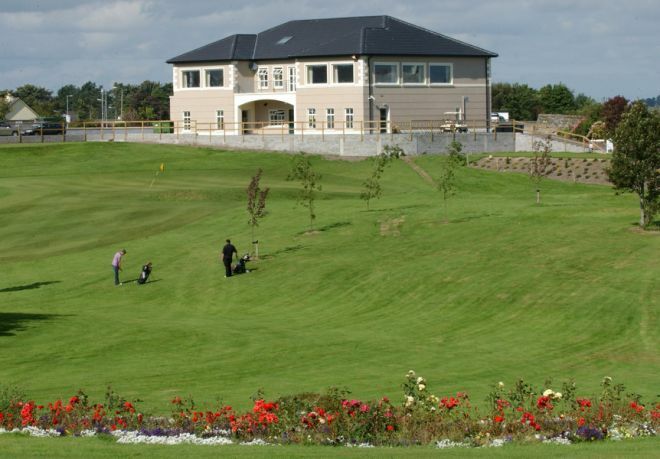 Ballina is one of the most scenic parkland courses in the West of Ireland. Designed by the late great Eddie Hackett, measuring 6,175 yards is a par-71 with a standard scratch of 69. The present course was part of the former Jones Estate at Musgrove, with evocative landmarks as "The Larch Woods" and "The Rookery" recalling the days before the acquisition of the lands in 1924. Set in rolling parklands, on the outskirts of the town, with a backdrop of the Ox Mountains and the Majestic dome of Nephin. Your game of golf at Ballina will encounter panoramic views of the rolling countryside gorse clad hills and wooded acres. Eddie Hackett had the following to say about the course "Ballina has created an interesting, testing and fair golf course. 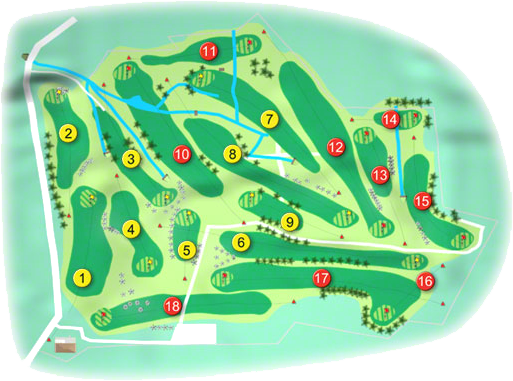 The eighteen hole course is in an ideal setting offering the golfer variety, challenge, interest and above all, enjoyable golf." 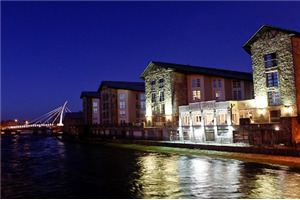 Ballina has a fine clubhouse and the visitor is assured of the warmest of West of Ireland welcomes that is extended to all. The Ladies of Ballina Golf Club won the Connacht Final of the Junior Foursomes when they beat Gort Golf Club by 2-matches to 1-match at Roscommon Golf Club on Sunday 2nd September 2018. They were led out by Shauna Smith (17) with Clair Cooke (20) who had a bad day against Ann Jordan (19) with Sara Brodrick (19) when going down by 7 and 6, next on the tee was Dolores Tuohy (15) with Bertha Cooke (25) who won their match by the minimum 1-hole against Ruth Naughton (18) with Josie Cummins (22) the bottom match was a much more comfortable result when Pauline Gilger-Touhy (19) with Mary Reynolds (24)beat Ellen Gill (17) with Marion Ruane (25) by 4 and 3. They made their way to Knightsbrook Hotel & Golf Resort to participate in the All-Ireland Deciders where they met Munster Champions Castletroy Golf Club in the All-Ireland Quarter-Final on Wednesday 26th September and beat them by 2-matches to 1-match against the ladies from Limerick City. Shauna Smith with Clair Cooke led them out again against Mary Beatty with Alice O’Dwyer and put the first point on the board with a 4 and 3 win, in the middle match Dolores Shauna Smith with Clair Cooke secured their passage into the All-Ireland Semi Final when beating Kathleen Argue with Gwynne Walsh by clinching the match on the 21st and the bottom match of Pauline Gilger-Touhy with Mary Reynolds was relinquished on the 18th to Dympna Tobin with Maeve Skelly. The following day they met Mid Leinster Champions Courtown Golf Club in the Semi-Final and lost out by 1-match to 2-matches against the Ladies from Co. Wexford. Yet again Shauna Smith with Clair Cooke led out and won their match by 4 and 3 against Catherine Quinn with Mary Osborne, next up was Shauna Smith with Clair Cooke who lost their match against Mary Kilbride with Stella Courtney and bottom match went to the wire when Pauline Gilger-Touhy with Mary Reynolds went up the 19th before losing their match against Mairead Sunderland with Eileen Cullen. Courtown went on and won the green pennant the following day when the beat Ulster Champions Shandon Park by 2½-matches to ½-match so near and yet sooo far a bit like the Mayo Football Team!! Ballina Golf Club won the Connaught Final of the Irish Junior Cup at Loughrea Golf Club on Sunday 7th August 2011. They made the long journey to Castlerock Golf Club to compete in the All-Ireland deciders the following September, they were drawn against Munster Champions Mitchelstown Golf Club in the All-Ireland Semi-Final. First on the tee was Jonathan Kelly who lost out to John Cahill by 4 and 3, next up was Liam Casey who los to Sean Lane by 3 and 1, he was followed by Jonathan Doherty who beat Adrian Gamble by 3 and 2, the penultimate match of Kenneth Lawrence went 4 and 3 to John Maguire, in the bottom match of Noel Dee was halved against Clem Leonard. Mitchelstown went on the clinch the green pennant the following day when the beat Ulster Champions Lurgan Golf Club by 4-matches to 1-match the following day. The Ladies of Ballina Golf Club won the Connaught Final of the Challenge Cup in the ILGU Inter-club Championship when they beat Bearna Golf Club by 3½ matches to 1½ matches at Donegal Golf Club on Saturday 21st August 2010. They made the long journey to Donabate Golf Club where they met East-Leinster Champions Dun Laoghaire Golf Club in the All-Ireland Semi-Final on Saturday 25th September. First on the tee was Josephine O'Hora (30) who win her match against Emer O'Sullivan (30) by 2 and 1, she was followed by Eithne Daly (31) who went all the way to the 19th-green before winning her match against Helen Waters (31), next up was Shauna Smith (31) who lost out to Katherine Verso (32) by 3 and 2, the penultimate match of Maire McLoughlin (33) against was a similar result against Maureen Duggan (32), it was all down to the bottom match of Ann McLoughlin (34) against Bernie Keogh (33) when Dun Laoghaire won by the slimmest of margins with a 1-hole victory . Ballina Golf Club won their first All-Ireland Irish Junior Cup at Monkstown Golf Club on Thursday 18th September 2008, when they beat Naas Golf Club in a trilling final. It was on to Monkstown Golf Club outside of Cork City where the met Munster Champions Adare Manor Golf Club in the All-Ireland Semi-Final on Wednesday 17th September 2008. When the team was, Bryan Cox, Stephen Lydon, Pat Howley, Paul McLoughlin, Robert Dervin, Jonathan Kelly & Michel McLoughlin. First on the tee was Robert Dervin against John Hickey, who lost his match by 3 and 2, he was followed by Pat Howley, who had a very convincing 6 and 5 win over David Carroll. Next up was Stephen Lydon who had a 1-hole win over Brian Hickey. The penultimate match saw Jonathan Kelly go down by 5 and 3 to Martin Costello, the bottom match saw Paul McLoughlin deliver the vital point when he beat Damian Harrington by 4 and 2. The following morning they met Leinster Champions Naas Golf Club in the All-Ireland Final, Bryan Cox lead against Ray Lynch and had a 1-hole win over the Kildare clubman. He was followed by Pat Howley against Eoin McCormack, this match went all the way to the 19th-hole before Ballina recorded their 2nd point. Next up was Stephen Lydon who had a comfortable 3 and 2 win over Gus Fitzpatrick. The next two matches went Naas’s way with Jonathan Kelly going down to David Prendergast by 3 and 2 and Paul McLoughlin loosing out to Conor O’Rourke by 2 and 1. The points were in the bag and Ballina recorded their first All-Ireland Final in the Cups & Shields. The team on the day was Bryan Cox, Pat Howley, Stephen Lydon, Jonathan Kelly and Paul McLoughlin. Ballina Golf Club won the All-Ireland Irish Mixed Foursomes in 1975, when the team was T. McLoughlin, J. Corcoran, L. Mitchell, S. Egan, N. McLoughlin, P. Rowe, M. Rowe, M. Jennings, D. Kelly and they were captained by M. Walsh. Ballina Golf Club moved to it’s present location at Mossgrove in 1924, but there is clear evidence that the club is in existence since 1910. 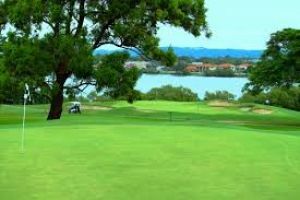 Members played on a nine hole course at Knockleigh, within ten minutes walk from Ballina Railway Station. Harold Scroope was first Captain, John Garvey was President, with John Flanagan as Hon. Secretary. Annual subscription was one guinea (twenty one shillings) for men and 10/6 (ten shillings and six pence) for ladies. The course at Knockleigh was 2185 yards in length and was marked out by Charles H Wilkinson of Malahide in September 1910. The club was to move on to John Garvey’s property, known as Davis’s field, on Quay Road before finally settling in its present home at Mossgrove in 1924. This property was part of the Jones Estate in South Ardnaree and the 63 acres was leased for £90 a year. The lease was for 21 years but after 7 yrs the rent was reduced to £50 and was later bought outright. John Hosford was Captain and James Kilgallon, a local man was appointed green keeper in his 70th year. The course was initially mapped out by "Doddy" Guy and William Huggard and later developed as the original 9 hole course by Messers Crabbe and Beattie from Dunlops. The former caretaker’s house was converted into the first clubhouse. The club gradually developed at Mossgrove but there were some lean times during the war years when it was barely ticking over. At one stage there was even pressure from local farmers to have the land divided for producing food! Everything was rationed and at one stage the bar manager was ordered to only sell golf balls to members if he was satisfied they were not stockpiling them! A further sign of the times in the war years saw the sixth and eighth fairways lined with stone filled barrels to prevent planes landing! The clubhouse was updated and renovated in 1974 during the captaincy of Dr. E Boyle. The official opening was celebrated by the staging of an exhibition match featuring four internationals, Eddie Dunne, Rupert de lacy Staunton, Mark Gannon and Hugh Mc Keon. 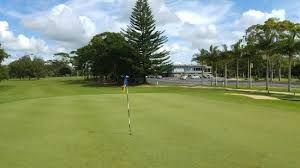 However, by the mid eighties the winds of change were blowing and towns of comparable size to Ballina were expanding their golfing facilities. Our attractive, scenic 9 holes would not be adequate in the years ahead. An EGM in July 1985 presided over by Club Captain Sean Rowley gave the green light to embark on the purchase of land with a view to expanding to 18 holes. Eleven acres were acquired from Mrs. Wallace of Shanaghy and in subsequent years further parcels of land were bought from Oliver Kilgallon, Mrs. Furey and Terry McCole. Well known golf architect Eddie Hackett was appointed course designer and after a number of feasibility studies, Frank Higgins, who had built Galway Bay, was appointed course developer. A wet summer in 1994 delayed completion but in September 1995 the new 18 hole course was officially opened by Enda Kenny TD, Minister for Sport. One great challenge remained however! The 1974 clubhouse was by now well and truly dated and after a period of intense fundraising and a few false starts, a new modern facility was fast becoming a reality. Michael O’Malley and Sons were appointed builders and a new ultra modern clubhouse was completed in July 2005 during the captaincy of Des Sweeney. 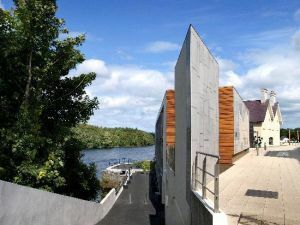 The farseeing pioneering work of past decades has produced a wonderful amenity for the golfers of the North Mayo Region and a valuable commercial resource for the Ballina area.